Choosing an engineering-rigorous, methodical and proven approach delivered by an experienced solutions provider is essential to long-term success. Integrated systems maximize the Protection Factor (PF). Saves lives and money associated with an incident or even a potential hoax. Minimizes the number of perceived and true casualties, and the extent of the exposure and contamination in the event of an incident. Ensures compliance with life-safety requirements and applicable codes, standards and regulations. Maximizes the reliability and the effectiveness of protection-in-depth type strategies, systems, and emergency response procedures. Minimizes the total life cycle cost of the integrated systems installed. Provides the critical information necessary in the event of an incident allowing for an efficient response as well as post-incident law enforcement and site remediation activities. 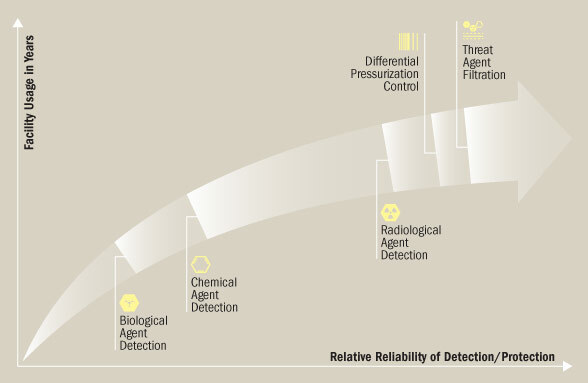 Threat Agent Filtration and Differential Pressurization Control, when combined with effectively designed, installed, integrated and utilized CBR agent detection systems, provides for the highest degree of protection and reliability over time. Providing comprehensive AT/FP and CBR agent building protection related protection-in-depth is an extremely specialized area with a high risk potential, with respect to both the potential loss of human life and extremely high financial costs if the systems are not properly designed, installed, operated, tested and maintained. The risks, financial costs and schedule related impacts can also be extremely high if the systems are not properly designed and installed and the systems fail the post-installation certification testing. A large percentage of system performance and reliability problems are caused by not having experienced personnel assisting throughout the design, construction, infrastructure installation, systems installation, integration and commissioning phases, and expensive equipment and system performance related problems and rework are the result. The impact, the risks and the financial costs will be even higher in the event of an incident. Learn how we can help you: Talk to a KD Analytical Building Protection Expert.